LG is finally ready to join the other big-brand players in the 2018 flagship party. 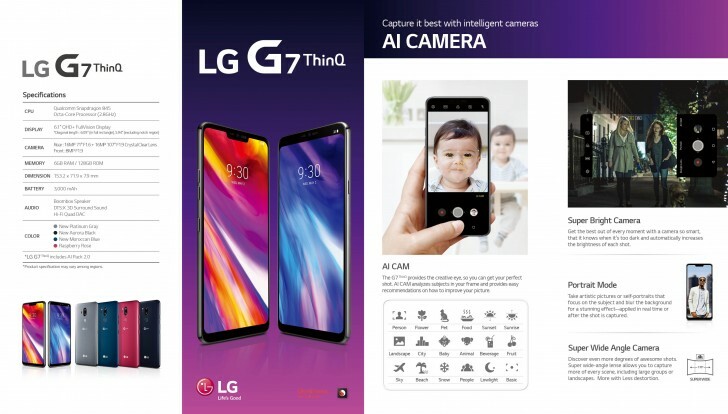 The G7 is officially here complete with the company's odd insistence on the awkward "ThinQ" branding. 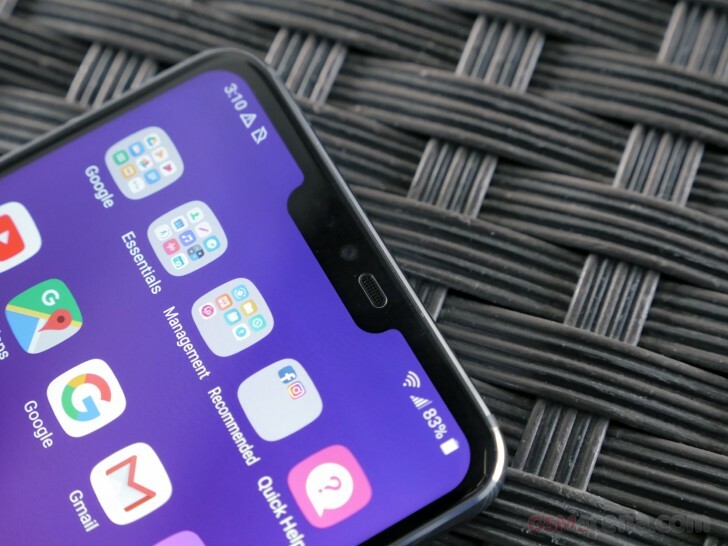 Starting with the G7's face, perhaps its most prominent new feature is the notch. LG decided to buy into the current trend with its fresh new 6.1-inch 19.5:9 3120 x 1440 pixel display. It's an evolution on the Full Vision panel, now surrounded by even thinner bezels. While it relies on LCD technology, rather than OLED, LG's fresh new M+ panel uses an RGBW arrangement, with the extra pixel intended to improve contrast and help in delivering a promised maximum brightness of 1000 nits. It is HDR 10 compliant and covered by a Gorilla Glass 5 protective layer. As for the notch itself, LG insists it's a "new second screen". The company pioneered secondary screens with the V-series back in the day, but has switched its phablets to conventional OLED panels since. Besides the notch, the LG G7 also features a hardware assistant button - a first for the company. Instead of going down the proprietary road, the Korean giant decided to stick with Google Assistant, effectively making this the first Google Assistant hardware key to appear on a smartphone. Speaking of hardware, the LG G7 remains true to the double-glass design approach (Gorilla Glass 5 on both sides), with an aluminum frame (notably thinner around the edges than on the LG G6) sandwiched in between. The entire body is IP68 certified and MIL-STD-810G compliant. The glass back enables wireless charging with the G7 touting both WPC and PMA support. You can also top the sealed-in 3,000 mAh battery, through the Type-C port, at up to Quick Charge 3.0 rates. Qnovo battery tech is on board, to prolong the battery endurance over the years. 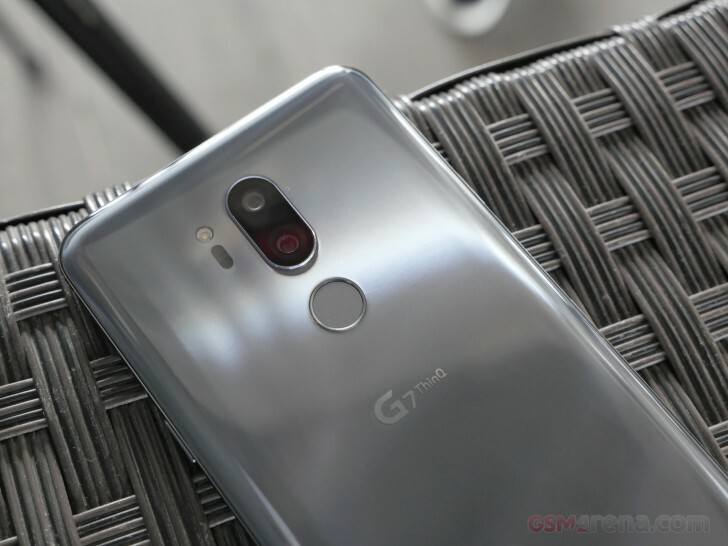 Other notable specs on the LG G7 include a Snapdragon 845 chipset, paired with 6GB of RAM and 128GB of internal storage. The latter is expandable via microSD. A flagship chipset also means the a standard connectivity set, including LTE-A, 3-Band carrier aggregation, Cat.16/13 (1Gbps/150Mbps) Wi-Fi a/b/g/n/ac, GPS, Bluetooth 5.0 and Dual-SIM support in some markets. In the camera department, the G7 sticks to the tried and true LG formula, with a pair of 16MP snappers - one with a 71-degree field of view, the other, with a super wide 107-degree one. The primary module sits behind an f/1.6 lens and is complete with OIS, phase detection and laser autofocus. The wide lens uses a dimmer f/1.9 lens, has no OIS and is fixed focus. The camera experience is boosted by LG's AI camera tech, as well as a smart pixel-binning technology for low-light shots. The secondary camera can assist with depth information for more convincing portraits as well. An 8MP, f/1.9, 90-degree camera handles selfies. LG approached the G7 ThinQ design with its typical emphasis on audio. It rocks a Boom Box stereo speaker setup, complete with DTS-X. The latter can simulate 7.1 surround sound and it's the first time we are seeing it on a smartphone. As for wired output, not only is the all-important 3.5mm jack intact, it is also connected to a high-end 32-bit Hi-Fi Quad DAC from ESS. For capturing audio, LG has thrown in a pair of microphones, which promise an impressive pickup range of up to 5 meters. The Google Assistant should benefit from the extra range as well. 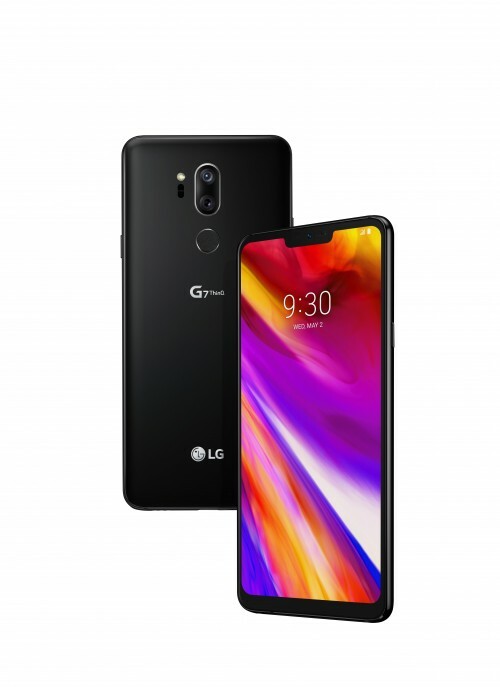 The LG G7 ThinQ will ship with Oreo , complete with LG's AI Pack 2.0. The company has already committed to releasing the Android P update once Google delivers the final version of its next release. Color options include: New Platinum Gray, New Aurora Black, New Moroccan Blue and Raspberry Red. Pricing and availability will be revealed at a later point. You can find out more about the LG G7 ThinQ in our hands-on over here.